An icon for worship since old times, the bull is a symbol of virility, power, physical strength and stamina. For that, this isopropyl and pentyl nitrite compound formula popper could not have a better name. Meet EL TORO. EL TORO STRONG is a very powerfull popper made from a mixture of isopropyl nitrite and pentyl nitrite. This specific combination results in an popper with increased strength, for lovers of powerful aromas. The 24ml popper bottle also comes with a pellet, a sphere inside the bottle that help eliminate the water in the poppers, thus granting it a much longer life without loosing power, even after opening. One whiff of EL TORO STRONG will make you see RED. Let the beast inside you come to life and enjoy the powerful sensations of the EL TORO STRONG POPPER. 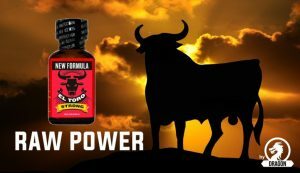 Buy EL TORO STRONG from 10,90€ a bottle at Buy Poppers Net, or buy in larger quantities for discounts up to 65%. If you buy in bulk you can purchase EL TORO STRONG for as low as 3,81€ a bottle. If you are looking for super strong, unique poppers, look no more. Visit www.buypoppersnet.com, take the bull by the horns and try this unique poppers with a unique formula. Next story RUSH SPECIAL EU FORMULA and RUSH ULTRA STRONG: what are the differences?